A last drink proved one too many for a 78-year-old Swede who fell asleep while trying to row home - from Denmark. Reports say the man had been drinking in the Danish town of Helsingor but found he did not have enough money for the ferry home to Sweden. Instead of waiting until morning, he stole a dinghy and tried to row the 5km (three miles) across the Oresund Strait to Helsingborg, police said. But he fell asleep half-way and drifted until he was rescued by the coastguard. The man, who has not been named, was found still asleep in the bottom of the boat, and towed back across the strait - a busy shipping lane - to Denmark. He was put on the next ferry home after he had sobered up, writes the Danish news service Ritzau. 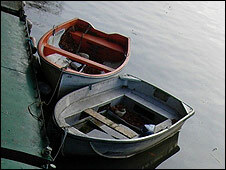 Police said the owner of the dinghy had decided not to press charges, Reuters reports.